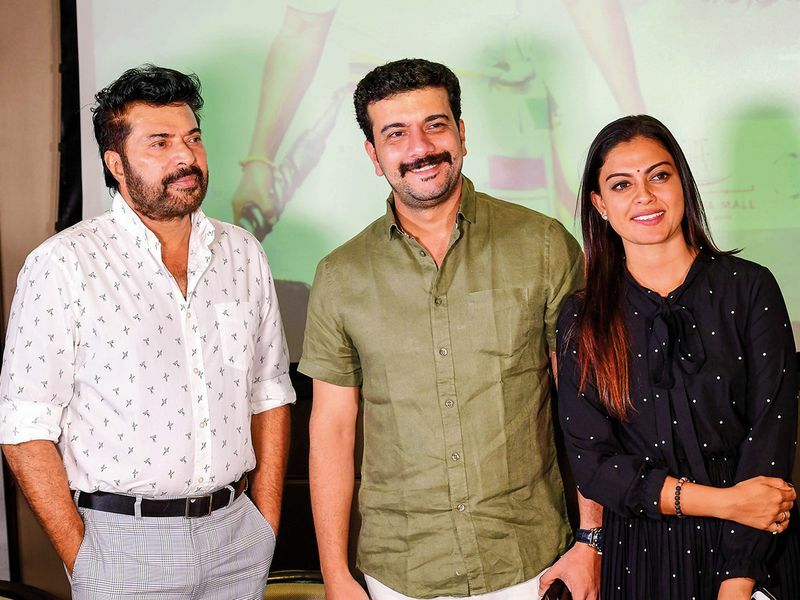 “If you say nothing when watching, what’s that… the 14th instalment of the Avengers series, then why my dear are you asking poor Raja?” A video of Mammootty making this comment, at a press conference here in Dubai has gone viral among Malayali movie buffs. Mammootty arrived in the UAE this past weekend to promote ‘Madhura Raja’, speculated to be a sequel to 2009 box office hit, ‘Pokkiri Raja’, with a small group of co-stars. The trailer of the movie, directed by Vysakh — who also directed Mohanlal-starrer ‘Pulimurugan’ — was released at a meet and greet event in Abu Dhabi on Friday. Known to be curt in his interviews and promotional events, Mammootty at the Dubai press event seemed light-hearted — joking with his co-stars and media, taking selfies with fans in attendance and even taking the photos himself if they were less than perfect. With his latest outing, Mammotty is looking to build on a film franchise akin to Hollywood. Raja isn’t the only character Mammootty is reprising in the near future. ‘Bilal’, ‘Kottayam Kunjachan’ (still in the pipeline) and ‘CBI 5’ are a few planned films featuring Mammootty playing iconic and much-loved characters — some from movies released in the early 90s — with new storylines. “Actually, as an actor, doing the same thing in a different film does not inspire much… Of course, being an actor, I can do better in that [role], staying within my limitations. I also cannot differ too much from the original character, so there are limitations, but I have to improve on so many other levels,” he said. During his 36 years in the movie business, the 67-year-old actor has managed to stay age relevant to each decade in various characters. While this is definitely a part of his appeal as one of Kerala’s megastars, he doesn’t seem to think of it as a result of something he consciously does. “Yes, and maybe that’s why the person Mammootty forgot to age,” Pisharody is quick to add. Reportedly, Mammootty has a very busy 2019 with more than six releases, including Pisharody’s directorial debut ‘Ganagandharvan’; ‘Bilal’ — a sequel to box office hit ‘Big B’; and Khalid Rahman’s ‘Unda’. “In ‘Ganagandharvan’, Mammookka plays a troupe singer and the story revolves around his personal life,” Pisharody told tabloid!. “‘Unda’ is again [a] different kind of story, I play the role of a [police] sub-inspector in it,” Mammootty said. “‘Kottayam Kunjachan’ is still in the pipeline, the one that’s ready almost is ‘Bilal’ — and you could call that a sequel because most of the characters from ‘Big B’ are there in this movie also,” he added. When asked if 2019 would mean sweepstakes for him, Mammootty laughed it off. “Movies belong to the viewers, the audience will decide,” he said. Anusree, Mahima Nambiar and Anna Rajan play the three female characters in the movie. “My character, Vasanthi, is a bold girl. My character’s story focuses on why I became this person, someone who doesn’t care about people, saying what she wants. Hopefully, by the end of the movie, people will accept why she became the way she is,” said Anusree. Indian National Film Award winners Salim Kumar and Nedumudi Venu are two other actors returning to ‘Madhura Raja’ in their roles from ‘Pokkiri Raja’. However, the film is missing notable characters from the 2009 movie, including Surya, played by Prithviraj, and Surya’s love interest Ashwathy, played by Tamil actress Shriya Saran. Tamil actor Jai Sampath plays a key character in the movie. Bollywood actress Sunny Leone makes an appearance in this movie in what seems to be her first in Malayalam cinema. Leone is reportedly shooting for her debut Malayalam movie ‘Rangeela’ directed by Santhosh Nair in which she plays the lead, alongside Krrish Menon. “The item song in this movie featuring Sunny Leone marks a turning point in the plot,” Mammootty said. ‘Madhura Raja’, produced by Dubai-based Nelson Ipe, is touted as an action movie with award-winning stunt coordinator Peter Hein directing Mammootty’s action scenes. He said that more than 90 per cent of the stunts in the movie were recorded live, minimising the use of CGI effects. Along with Hein and director Vysakh, the film’s scriptwriter Udaykrishna and cinematographer Shaji Kumar are also from the production team of ‘Pulimurugan’. The trailer released on Friday is reminiscent of typical stunt-packed South-Indian potboilers, ending with Mammootty saying, “Raja will do what he says, and only say what he does.” It is evident from the trailer that the movie plays on Mammootty’s star power more than anything. Madhura Raja will be released in theatres across UAE on Friday, April 12.